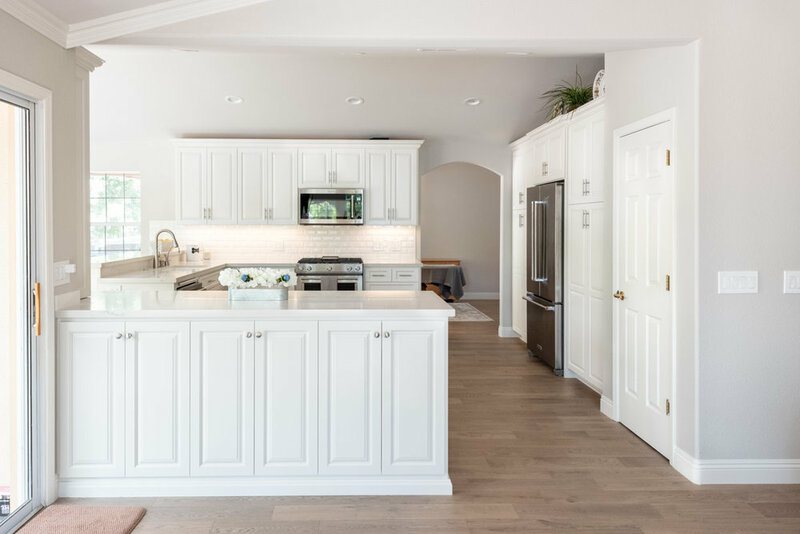 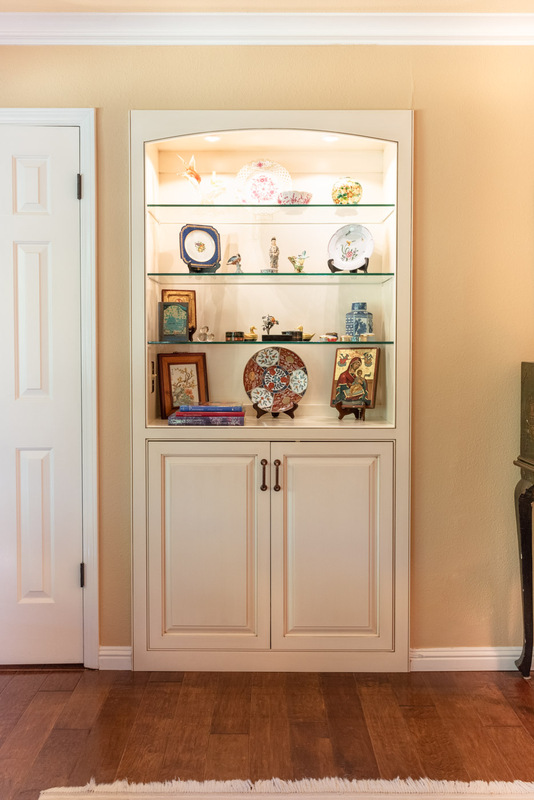 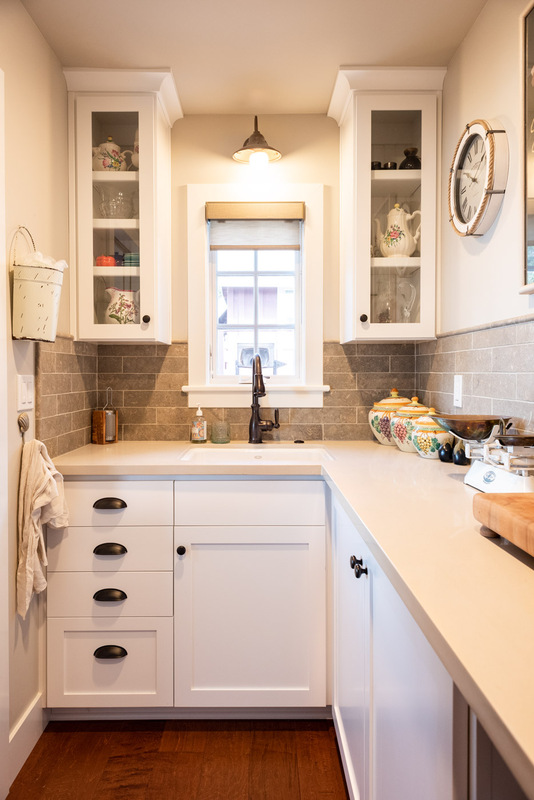 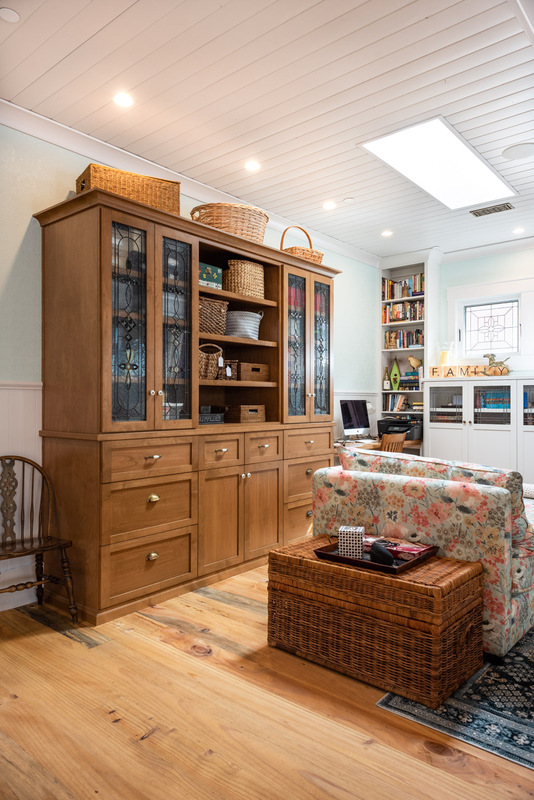 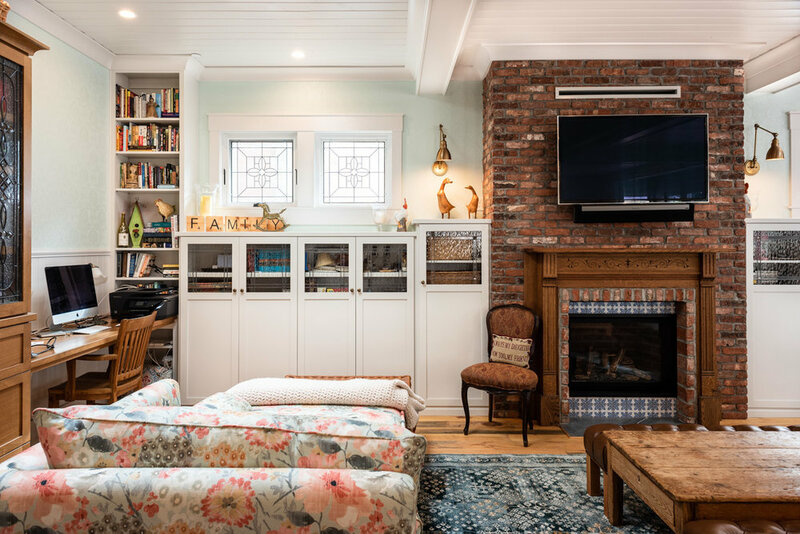 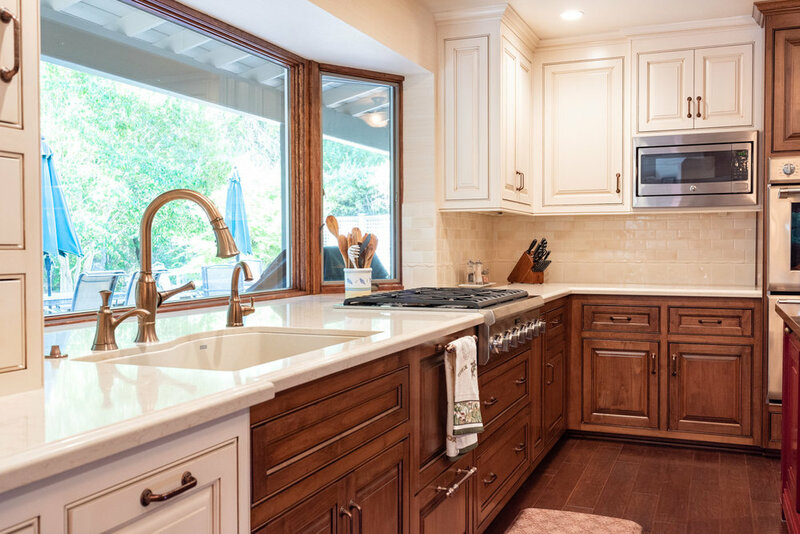 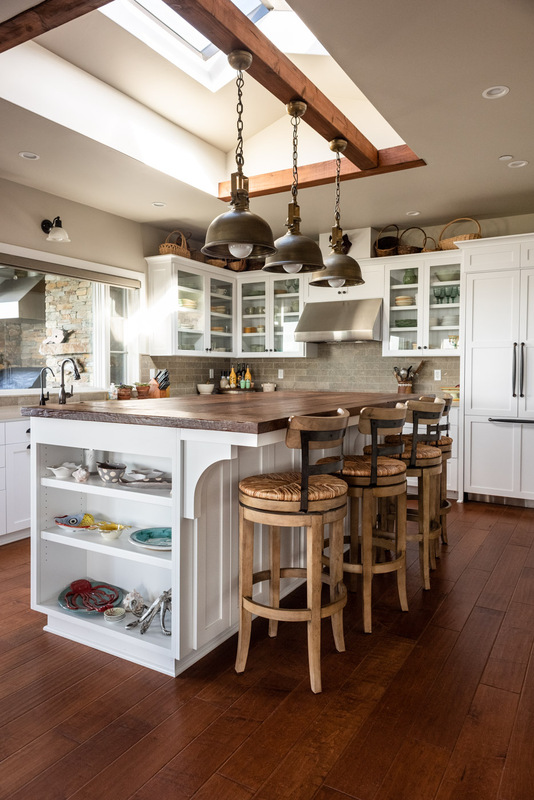 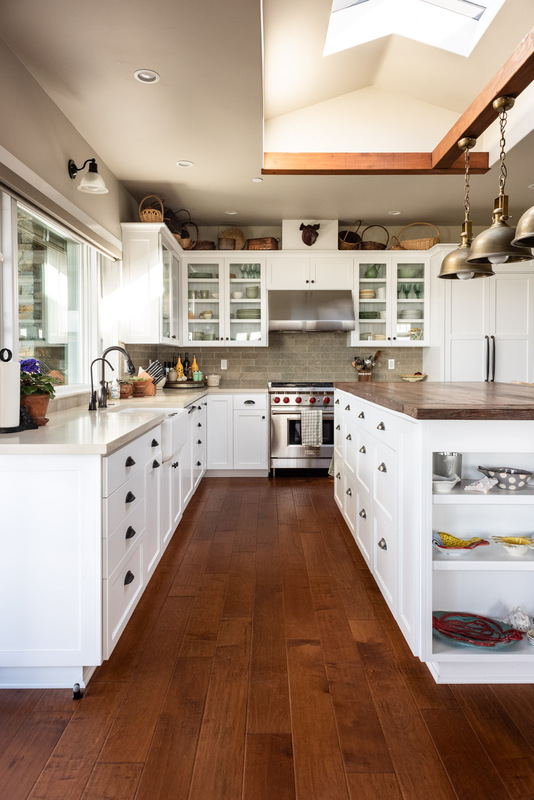 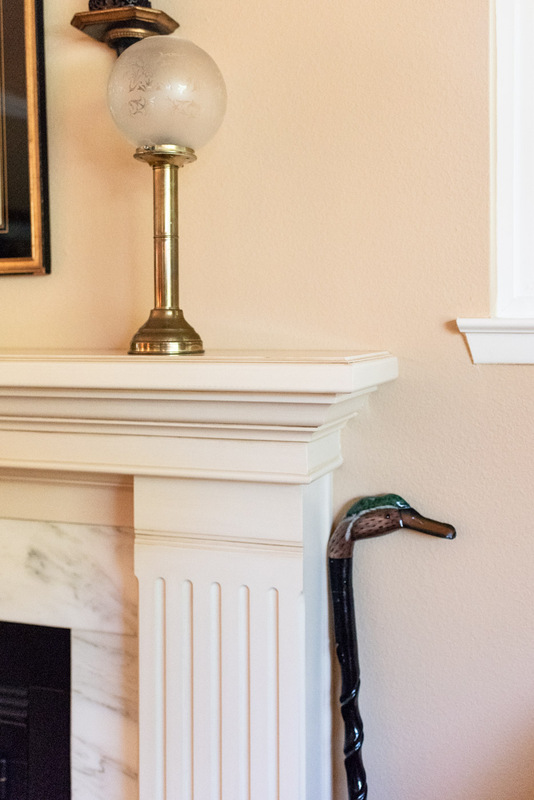 This warm and charming English country home in Atascadero, California features mixed cabinet finishes, a custom home bar and living room cabinetry. 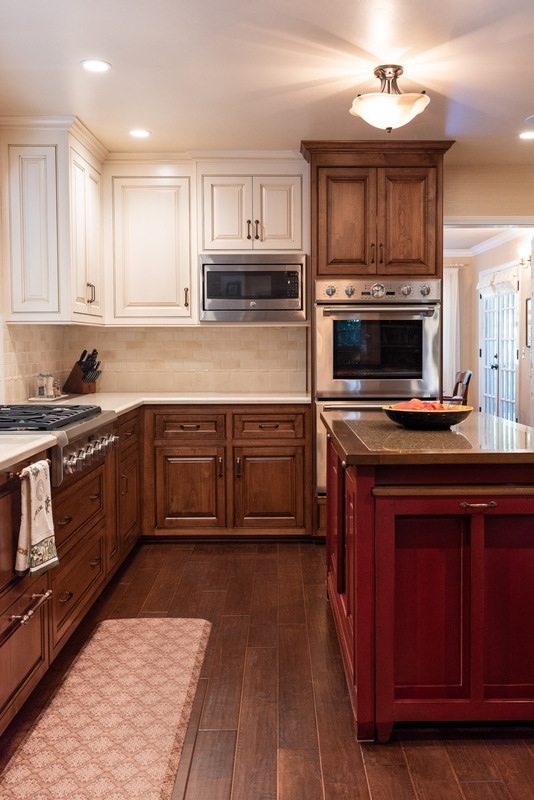 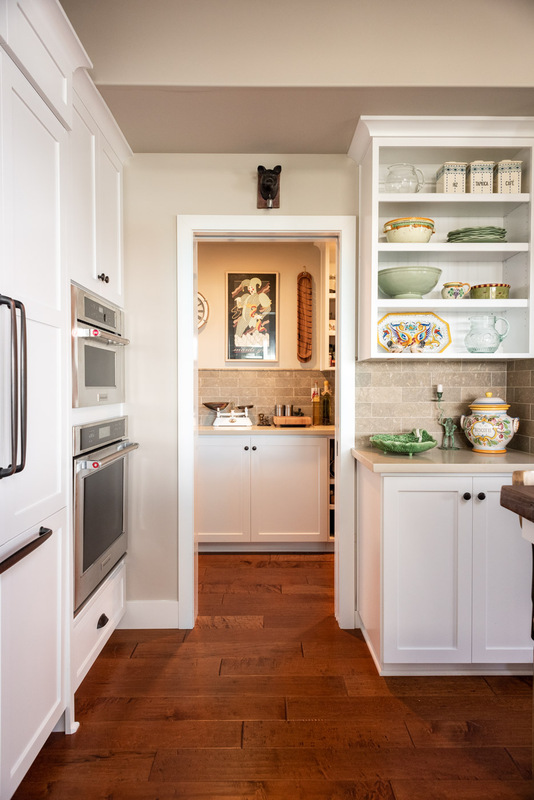 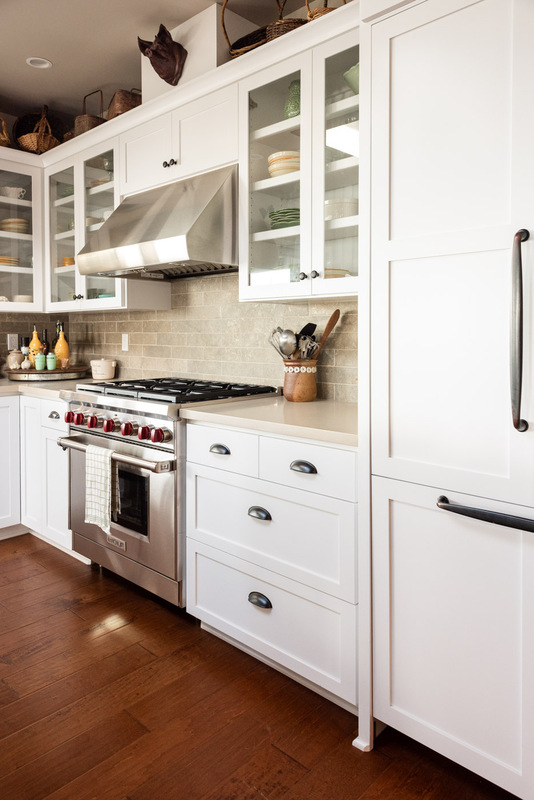 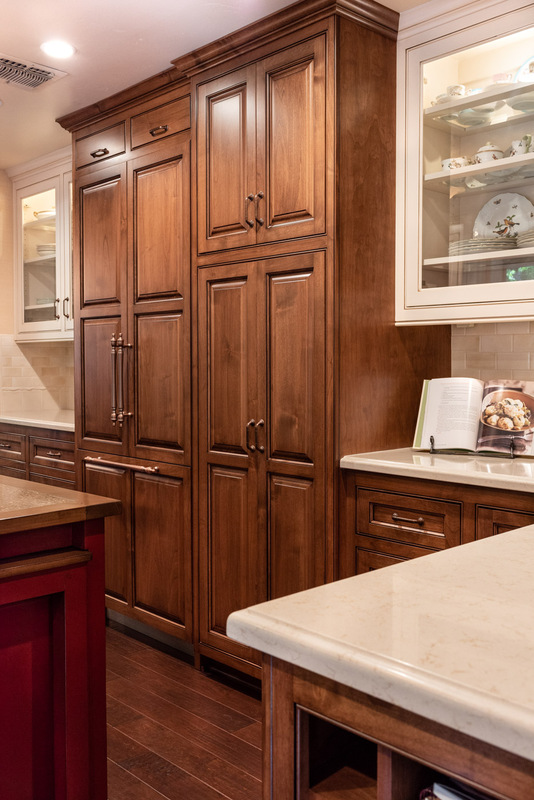 This country kitchen design features cabinets in three different finishes, including a dark Alder wood stain, creamy white paint, and an accent red painted island. 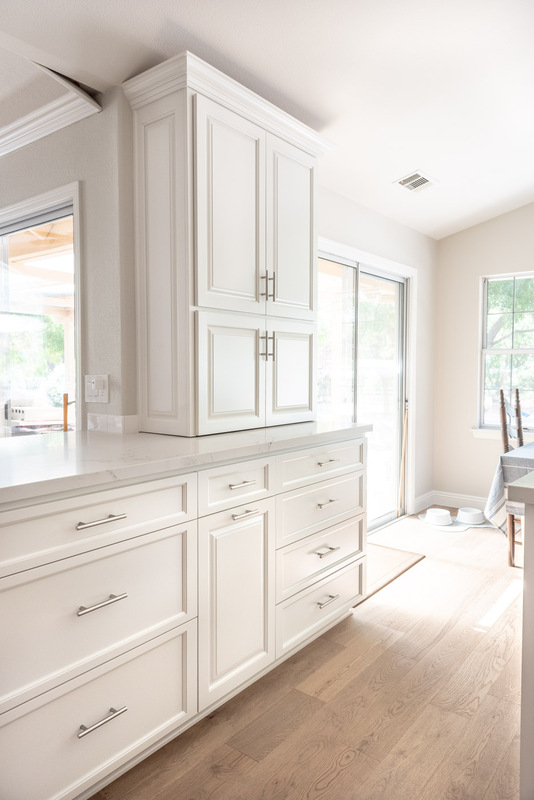 The G-shaped layout opens up into the dining area and provides the maximum amount of cabinet storage, countertop space, upper cabinet displays and bar seating available. 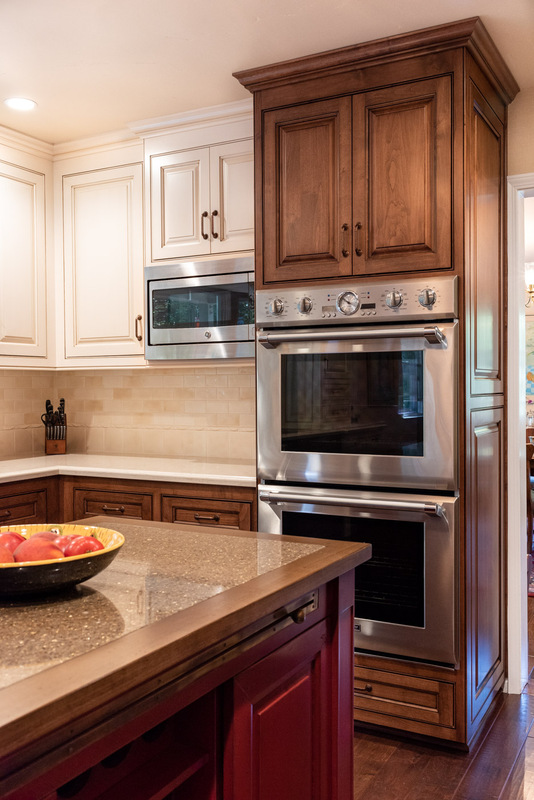 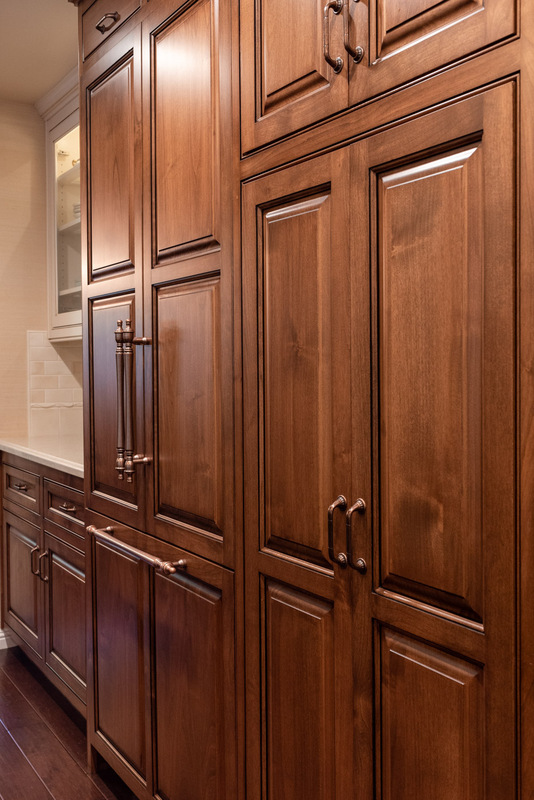 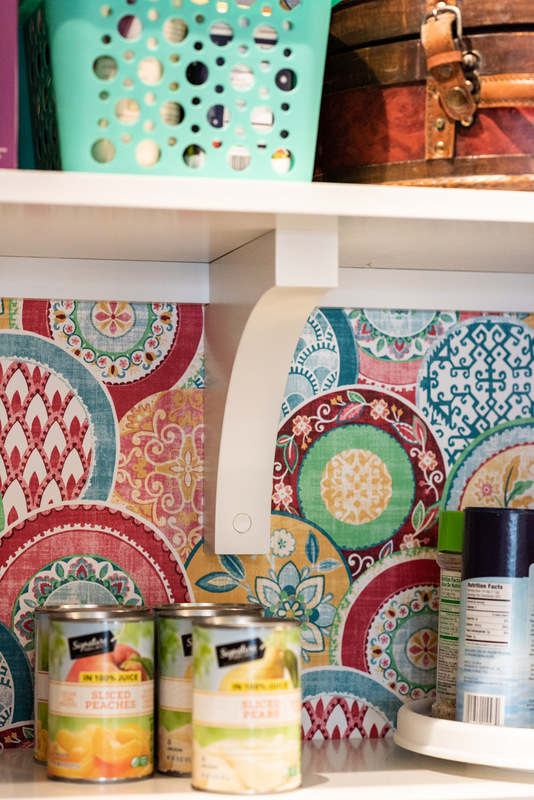 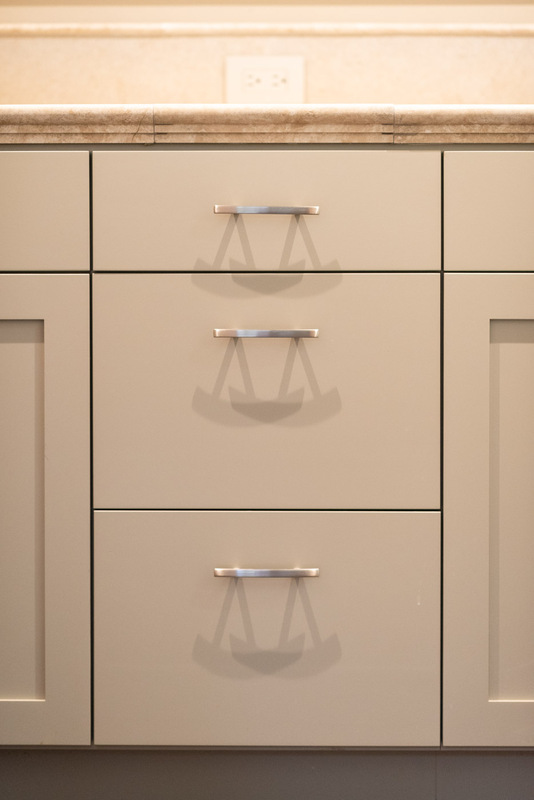 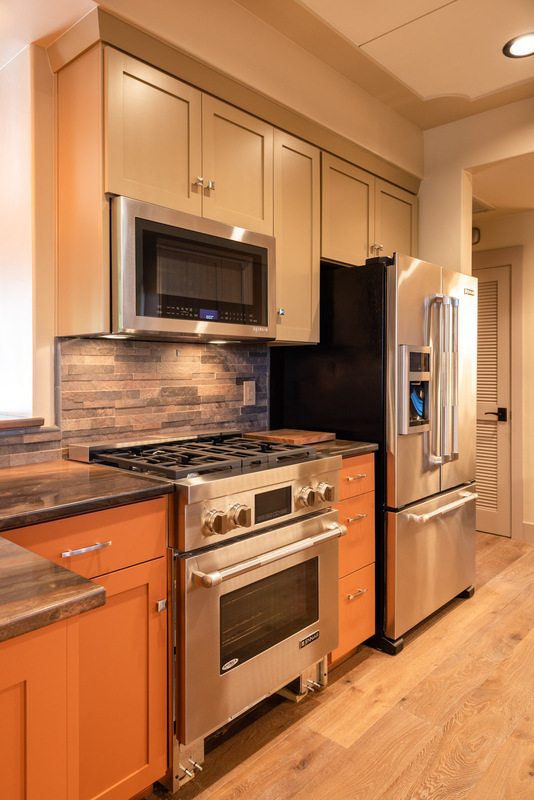 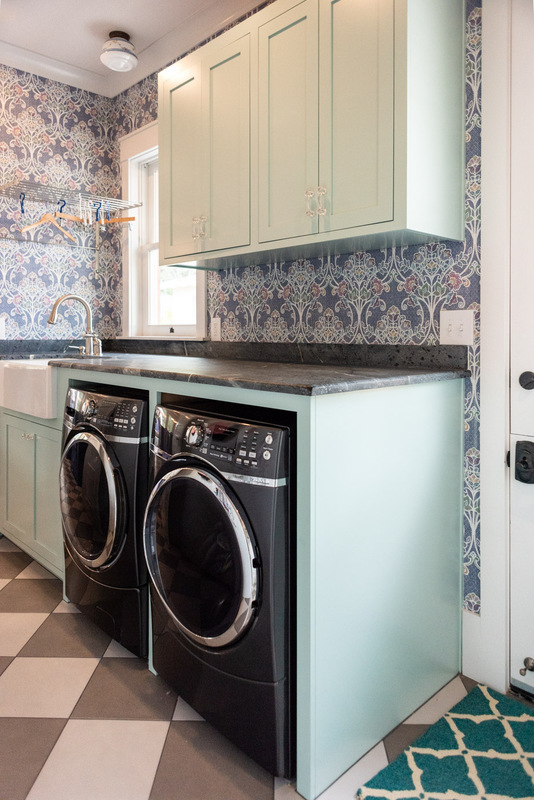 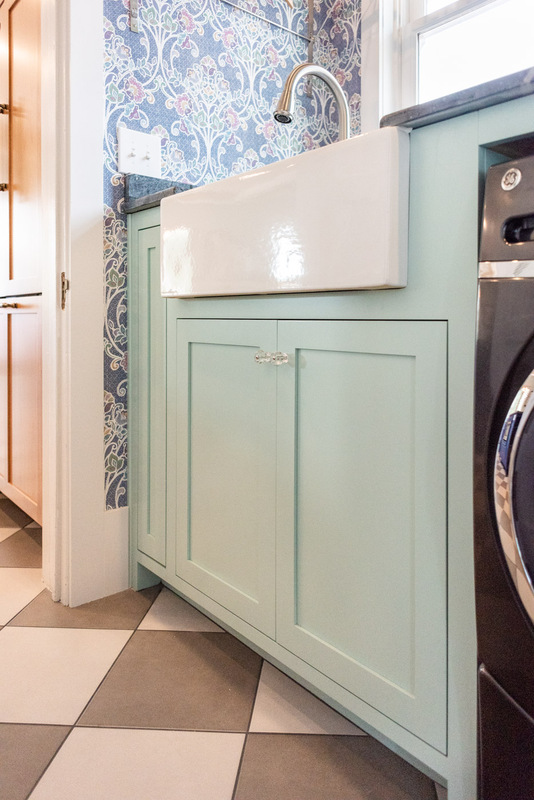 Custom appliance door panels allow for a seamless transition of cabinet finishes around the dishwasher, trash roll-outs and refrigerator. 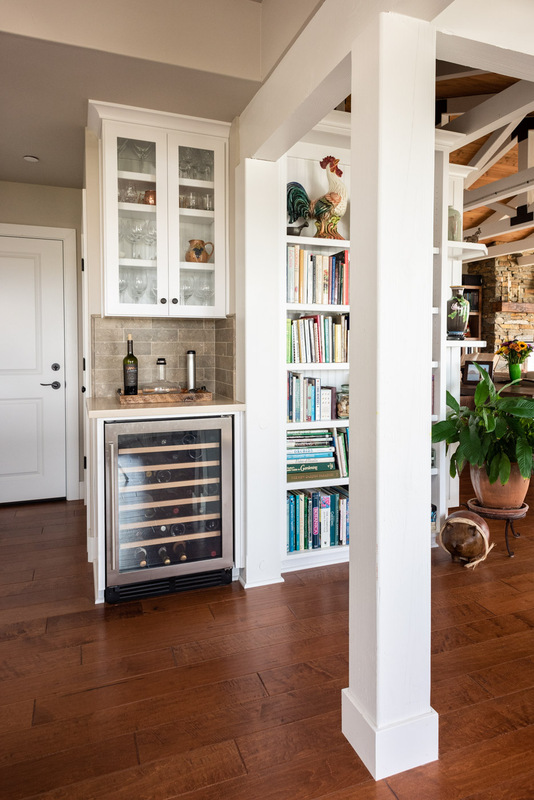 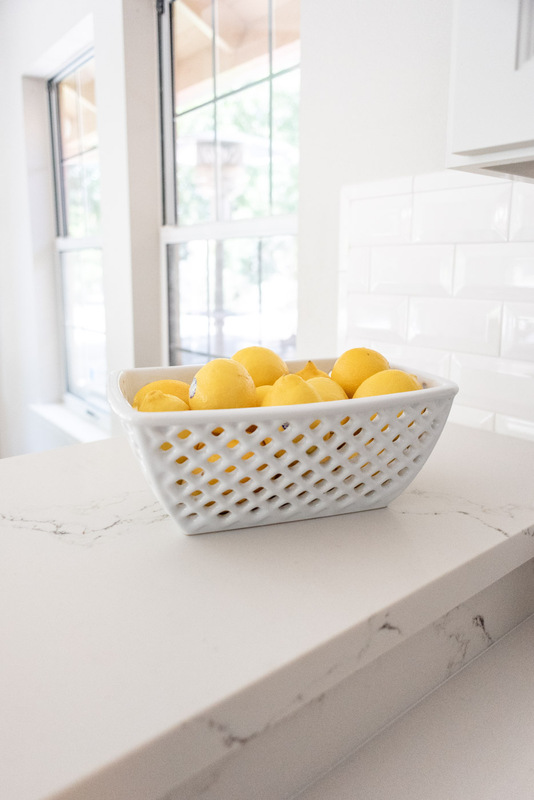 The dining area features a stand-alone home bar cabinet with glass display shelving, a custom wine fridge door panel, mirrored tile back splash and a quartz countertop. 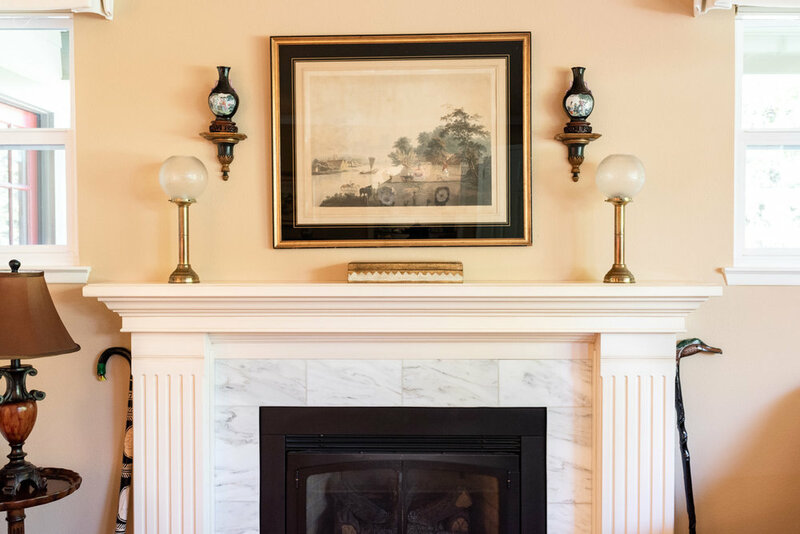 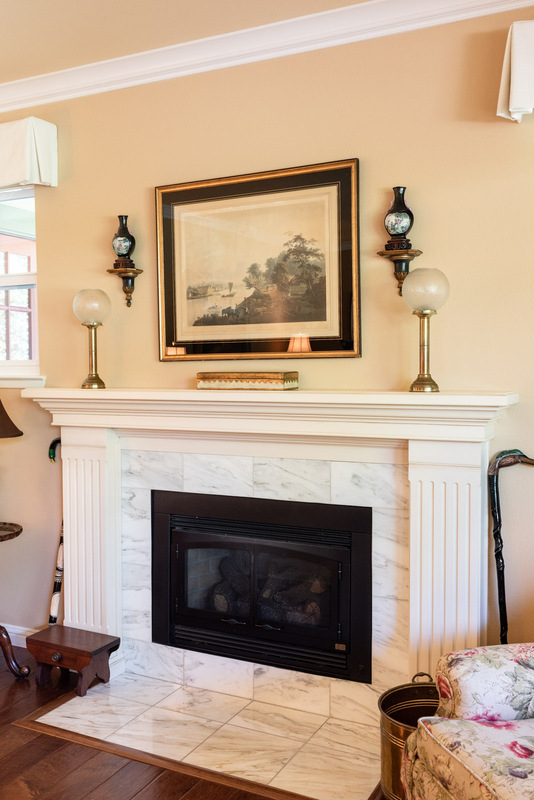 A custom white painted mantle surrounding the marble fireplace tile complements the built-in living room cabinet with glass display shelves. 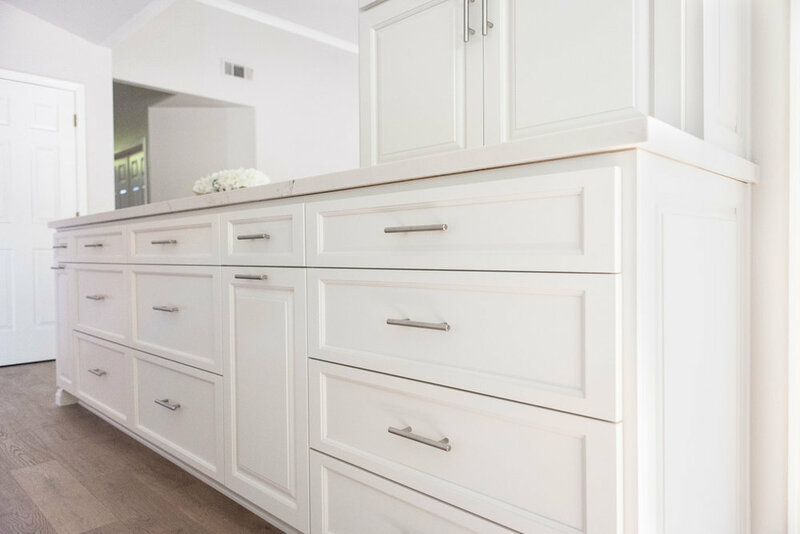 These two custom cabinet pieces, set in a creamy white paint finish, coordinate with the English country style of the formal living area. 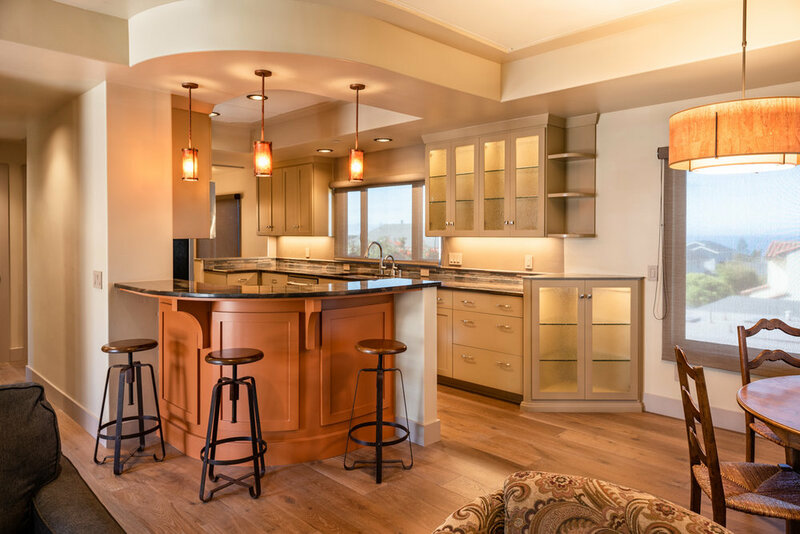 Overlooking the ocean in Morro Bay, California, this custom Craftsman home is full of creative design elements and warm, earth tones. 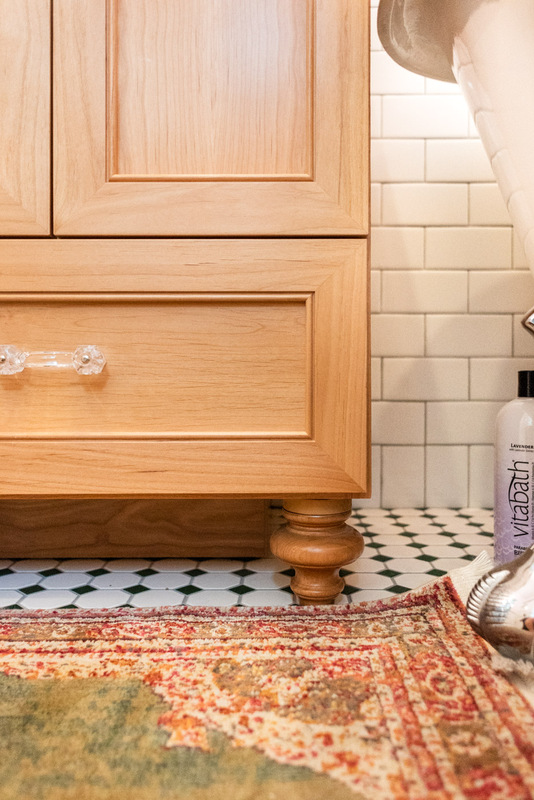 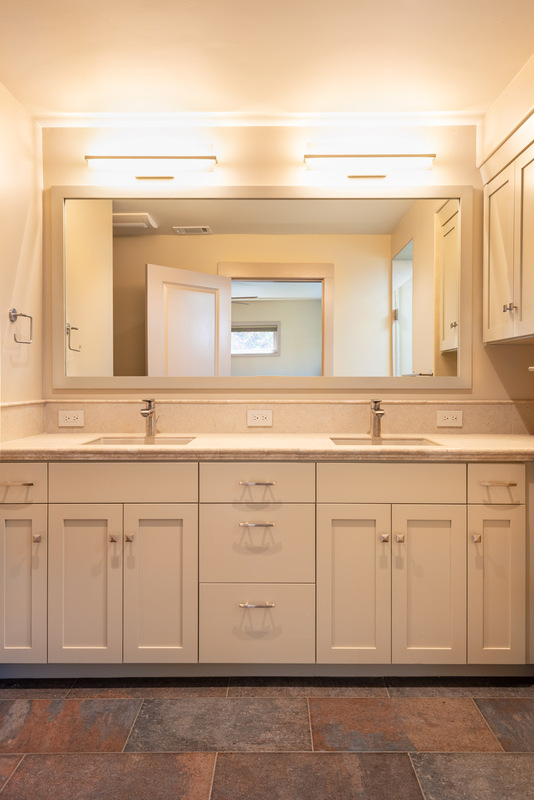 The similarities in the kitchen cabinets and bathroom vanities create a consistent and clean aesthetic throughout the home. 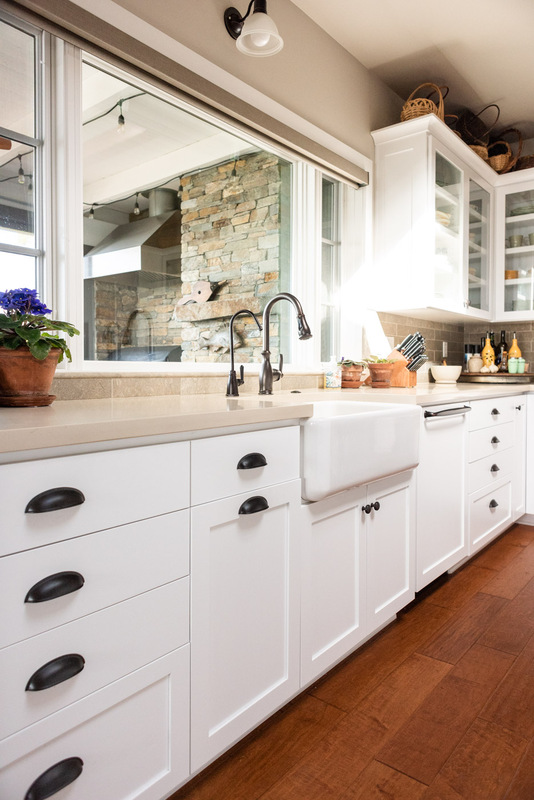 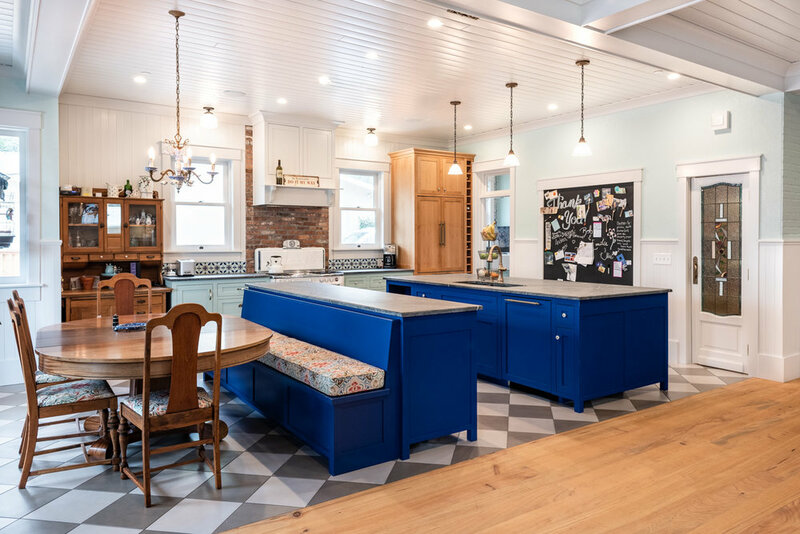 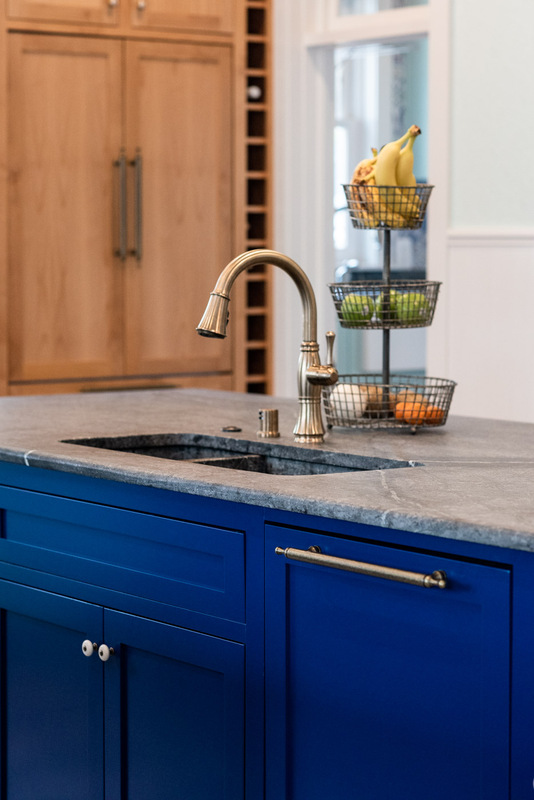 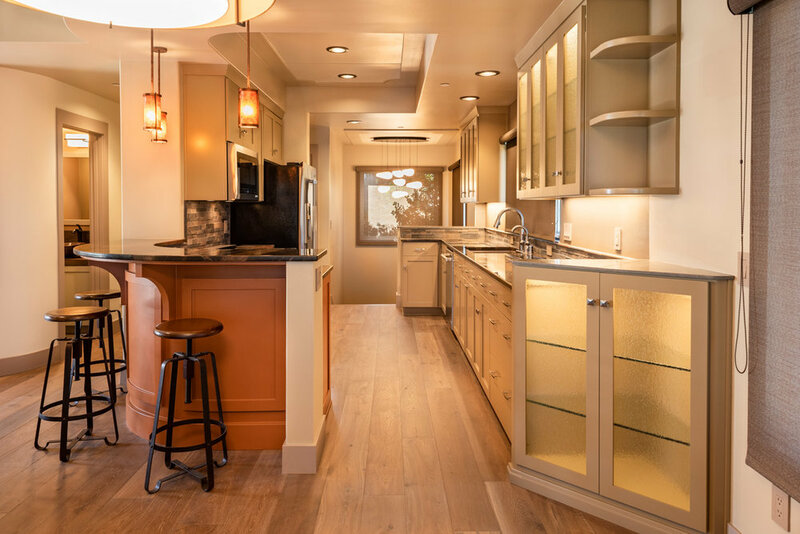 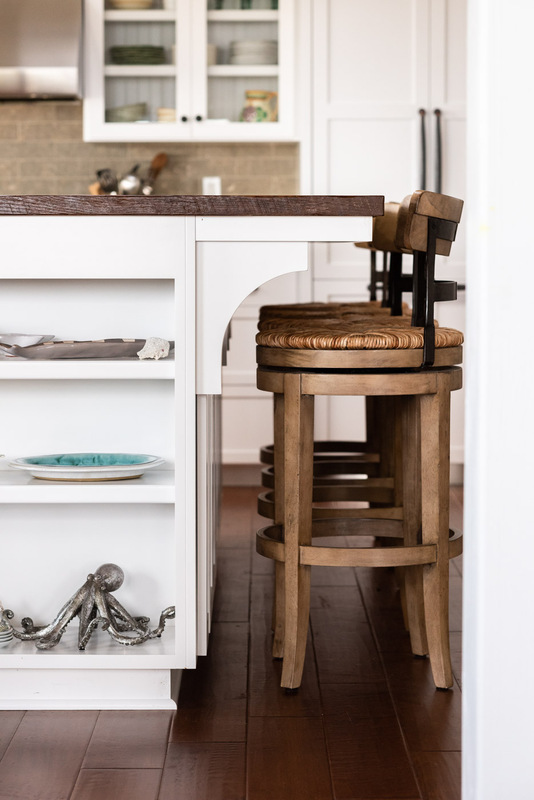 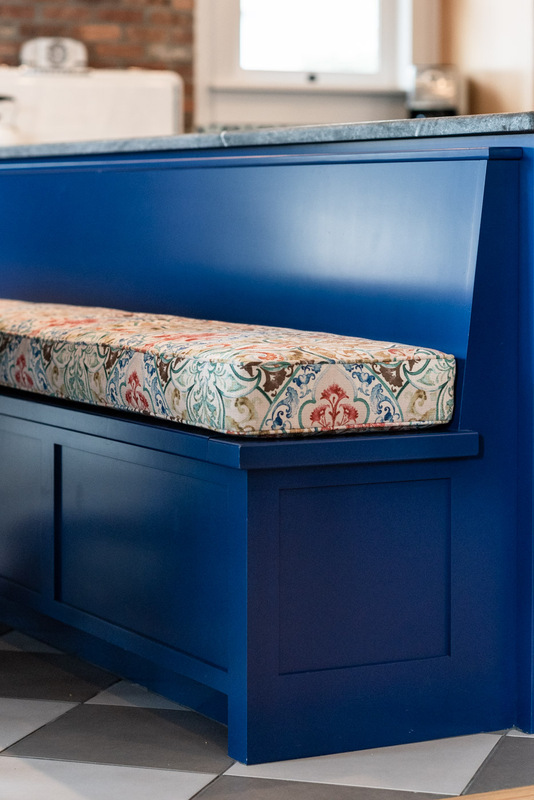 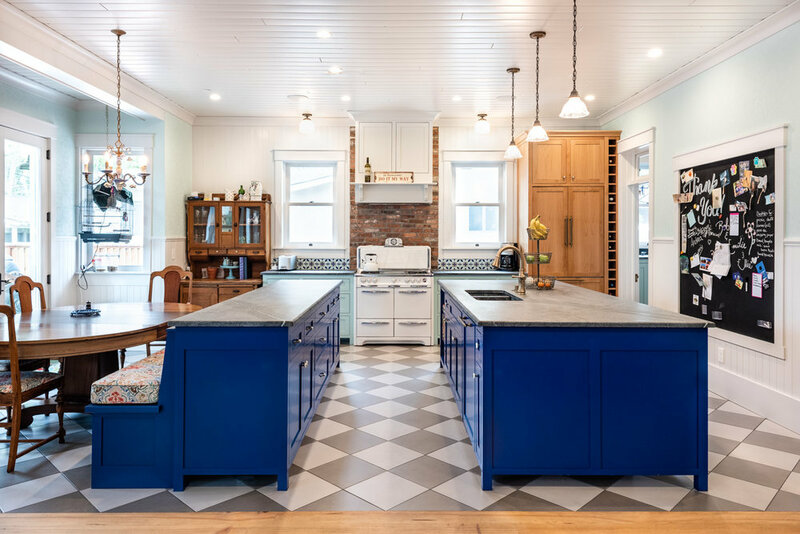 This kitchen features a combination of a galley and G-shaped kitchen layout, which allows for an adequate amount of countertop space as well as the perfect bar seating area. 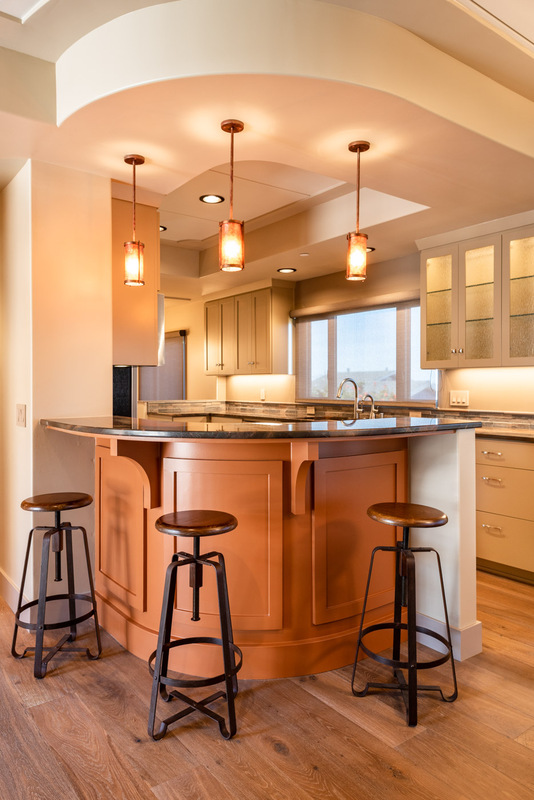 A unique curved peninsula set in an accent rust color creates a focal point that draws the eye into the kitchen from the dining and living areas. 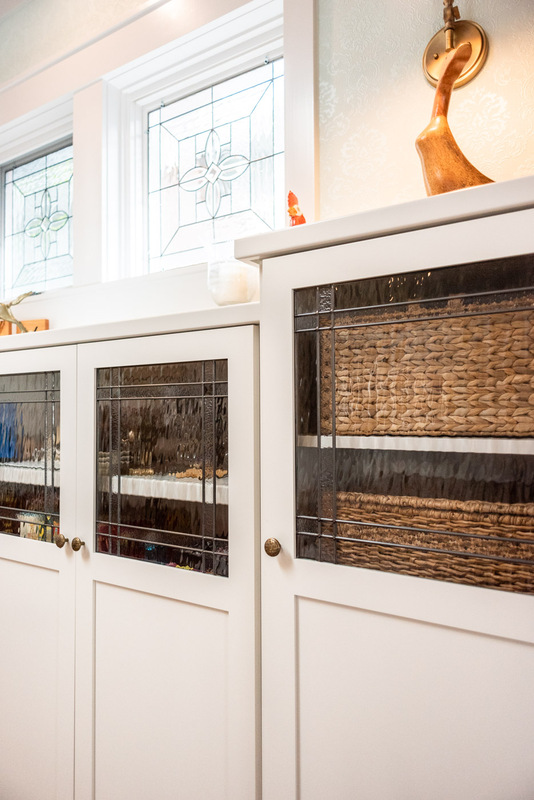 Glass upper cabinets leave room for the display of dinnerware and glassware. 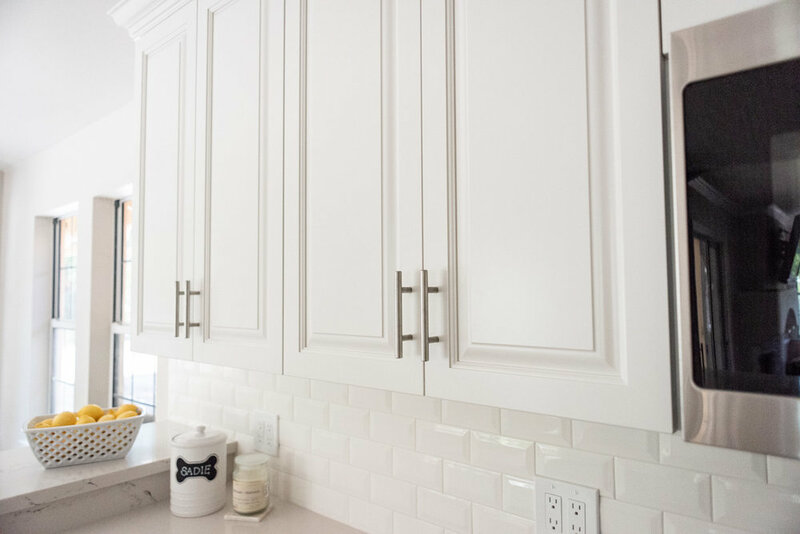 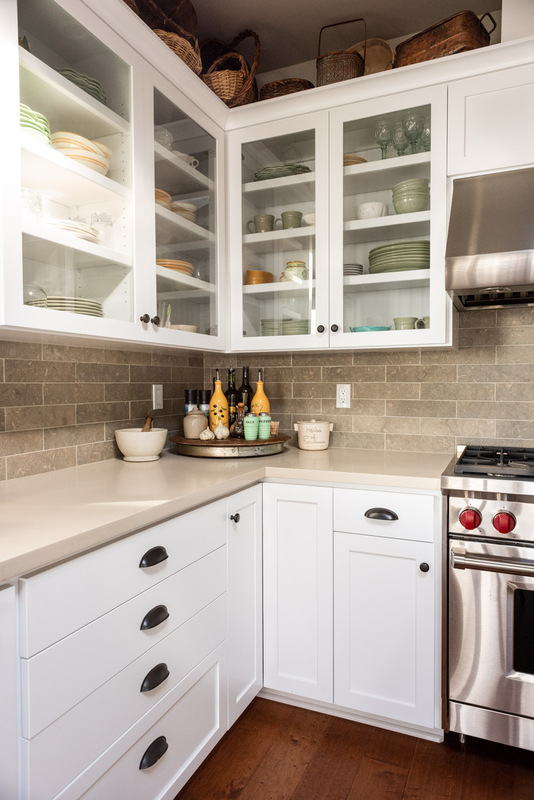 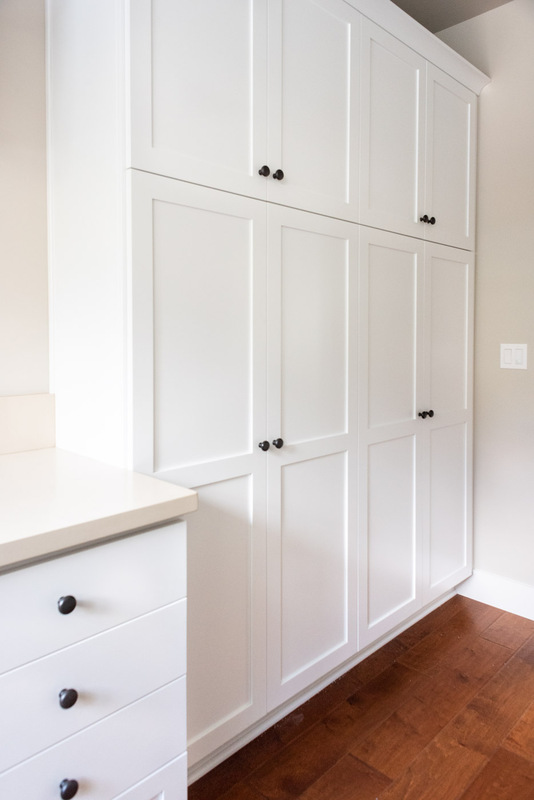 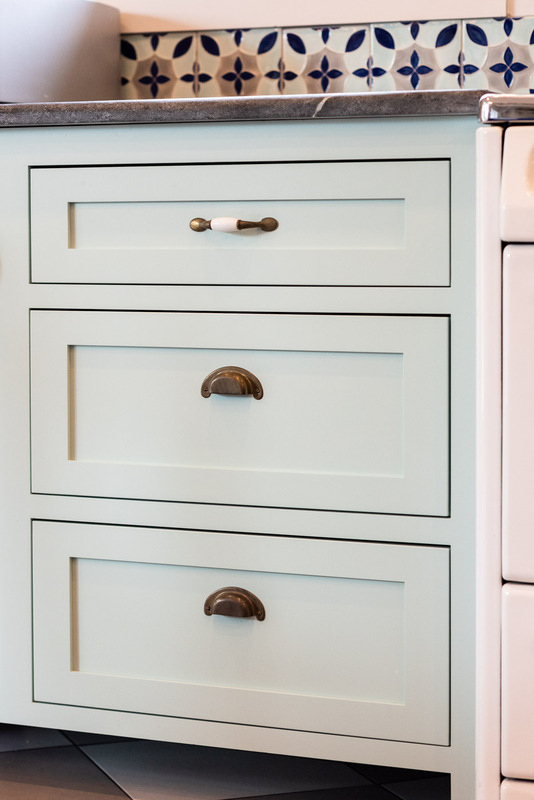 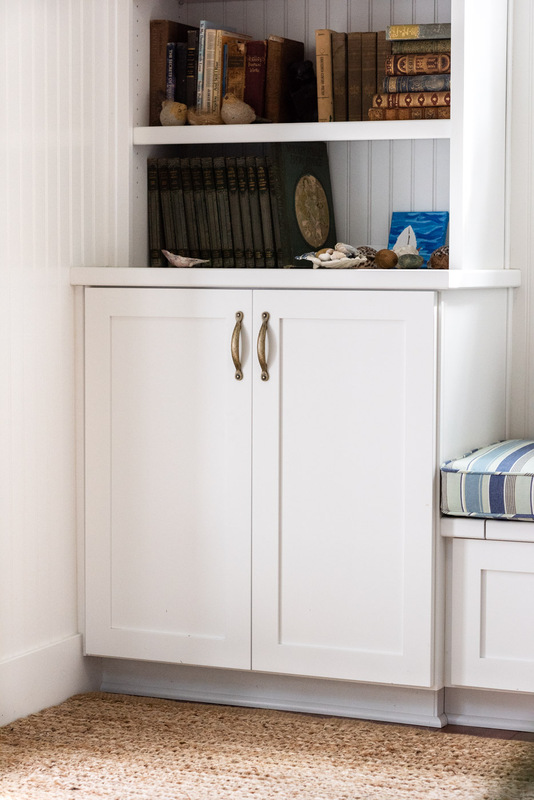 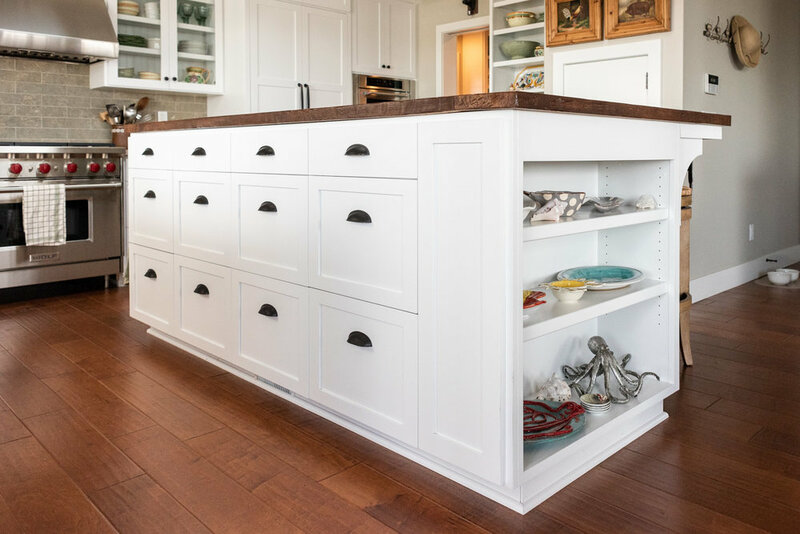 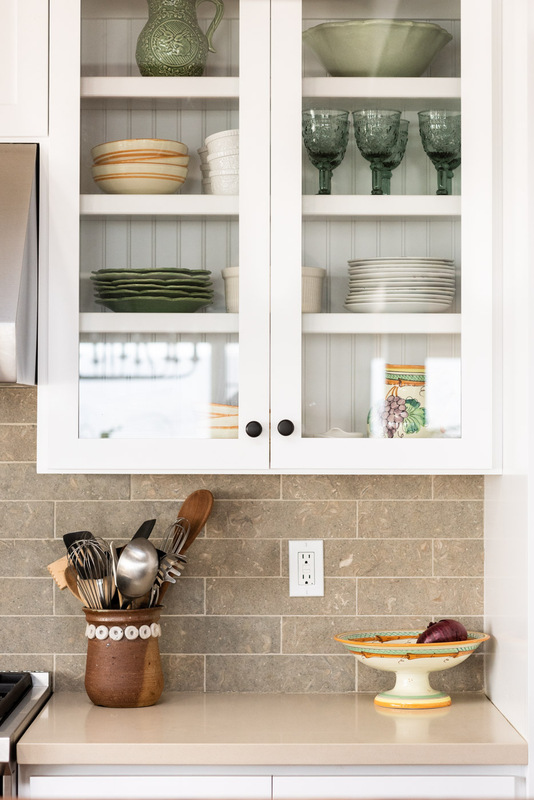 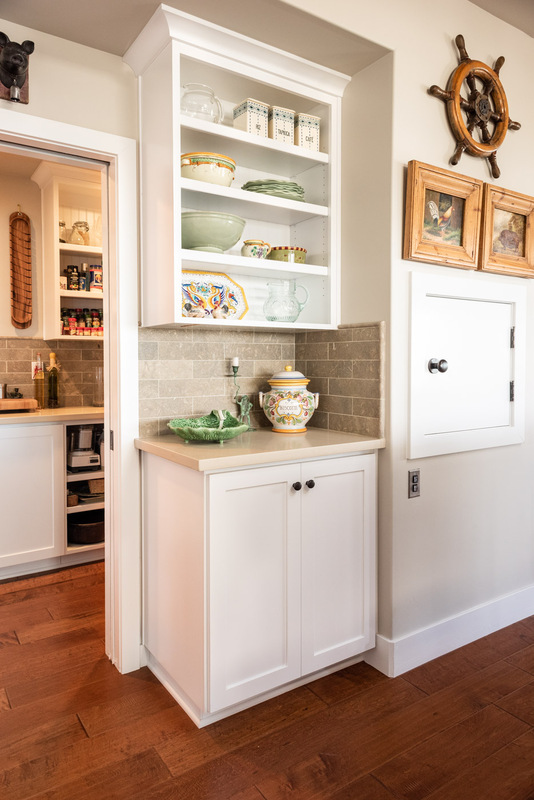 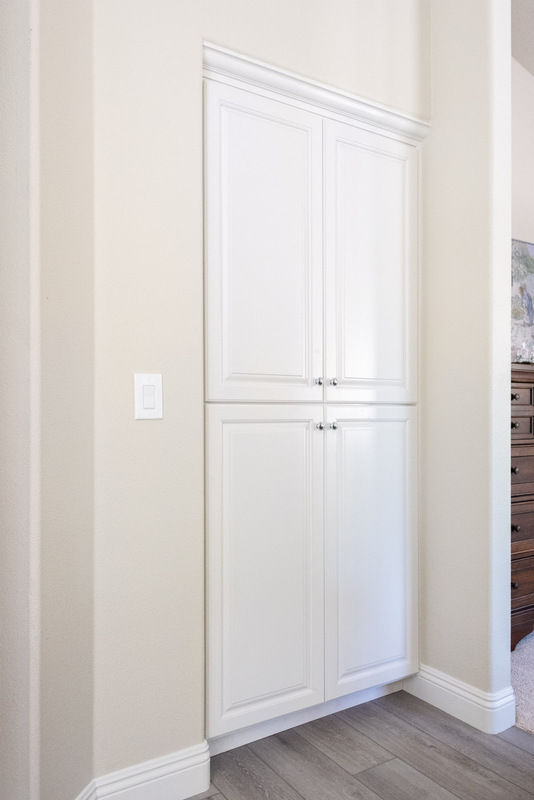 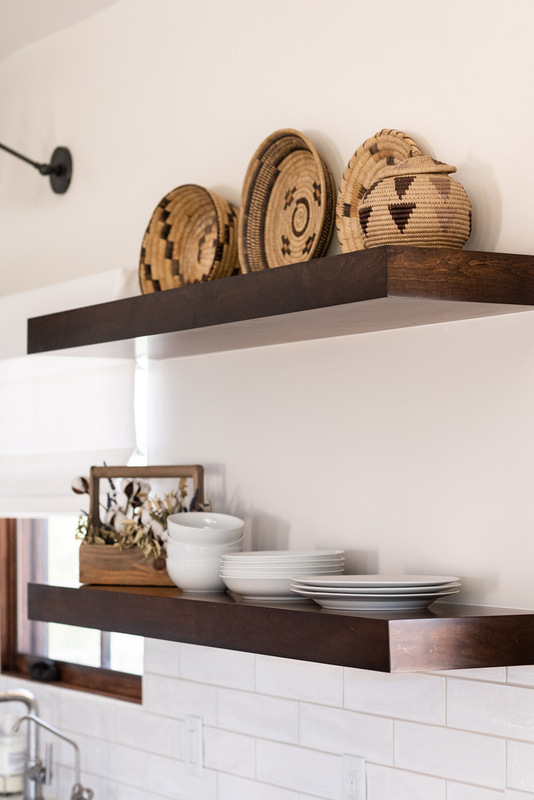 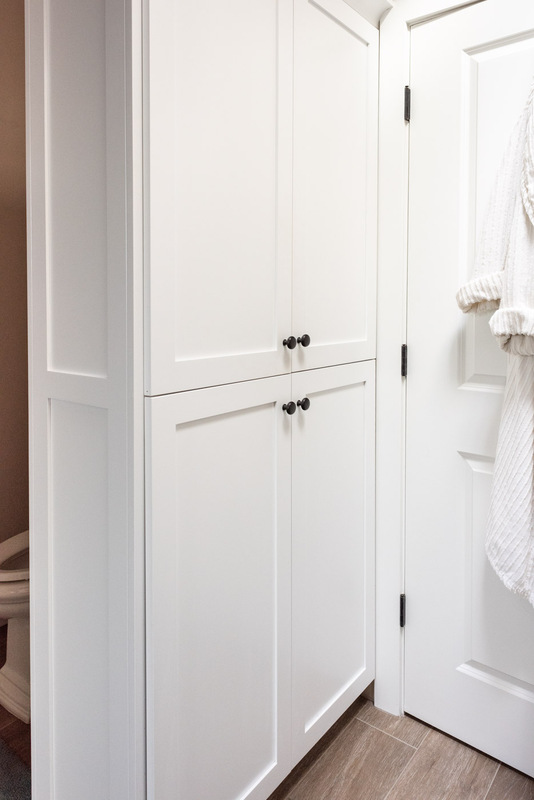 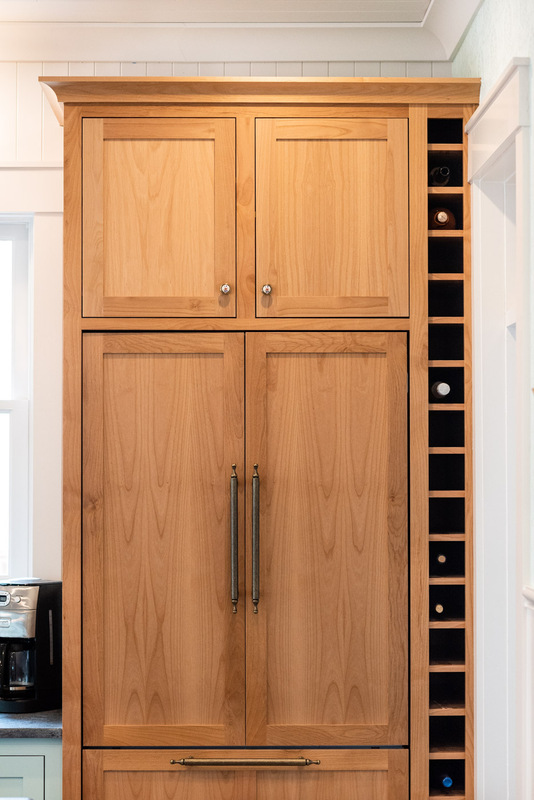 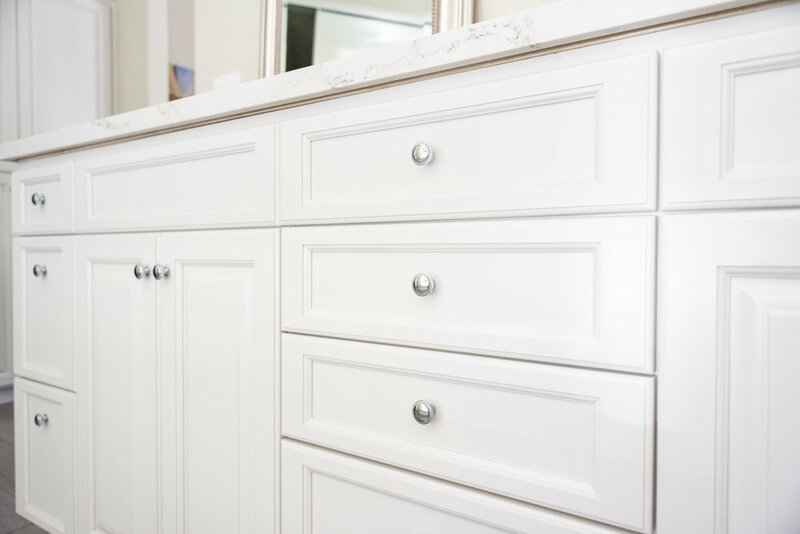 A series of drawer banks and cabinet doors are strategically placed along the base and remaining upper cabinets to provide plenty of storage. 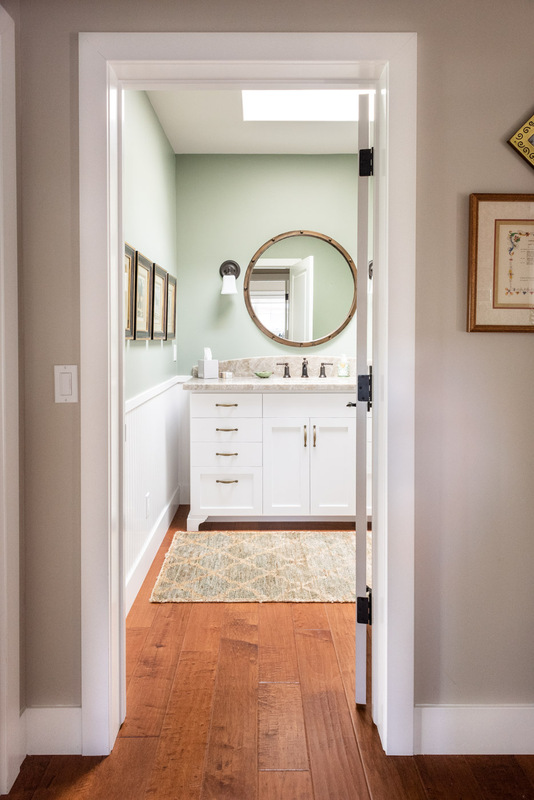 Both the master bath and hall bath continue the look of the kitchen cabinets with painted shaker door styles and brushed nickel hardware. 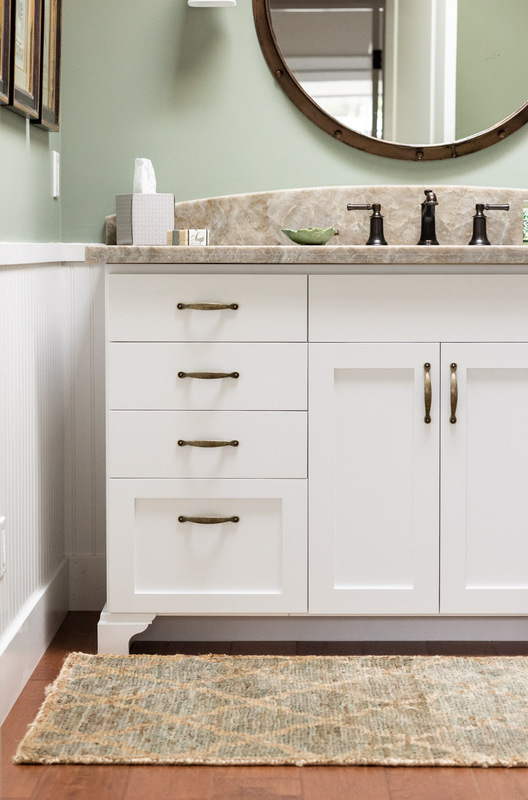 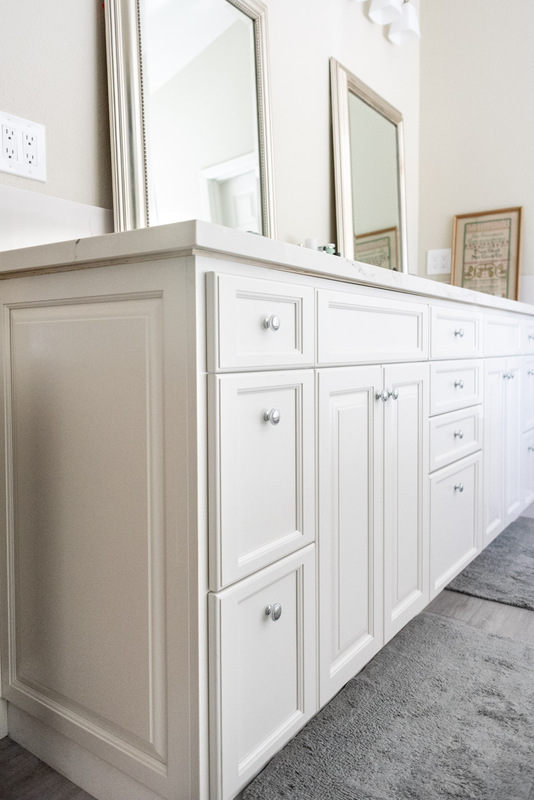 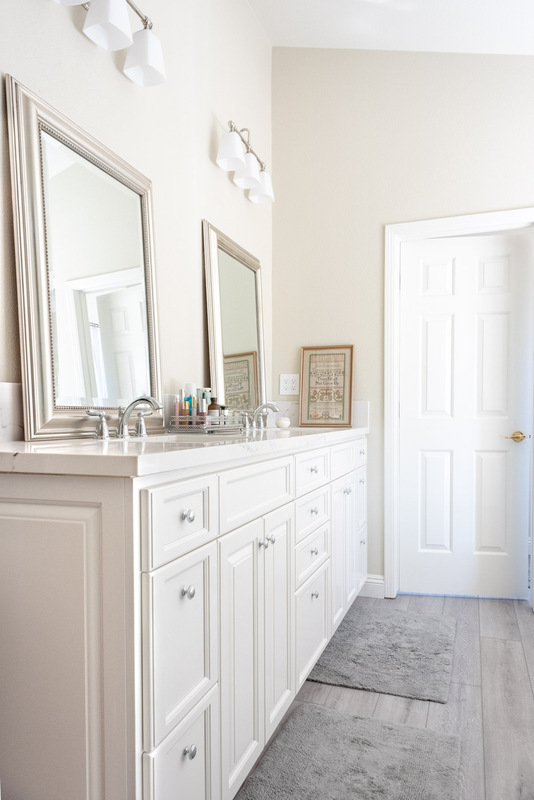 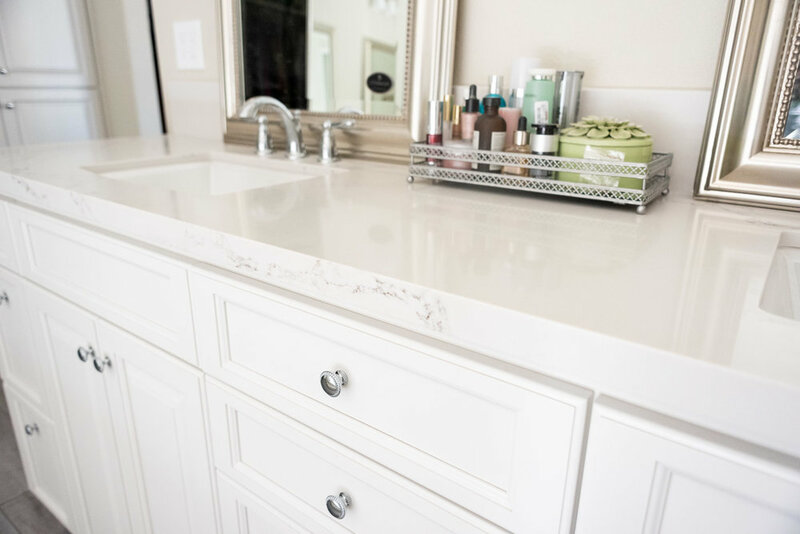 The master bathroom vanity maximizes storage with a combination of drawer banks, base cabinet shelving and a bi-fold medicine cabinet door. 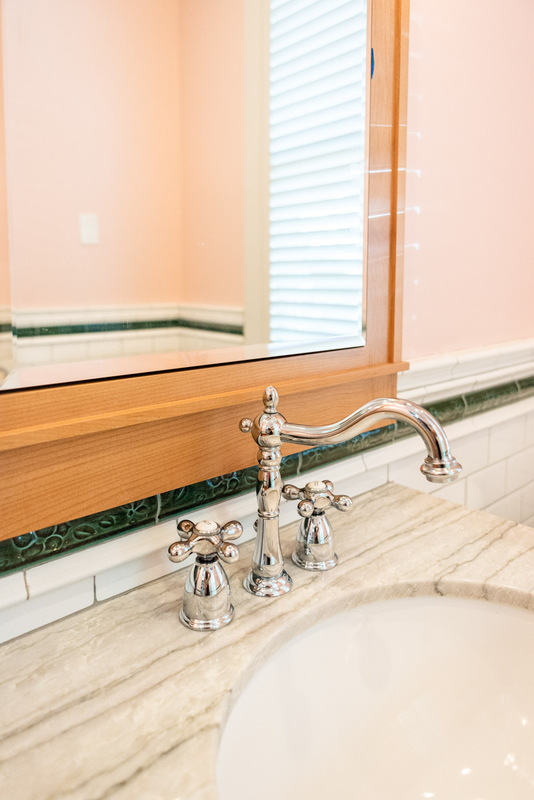 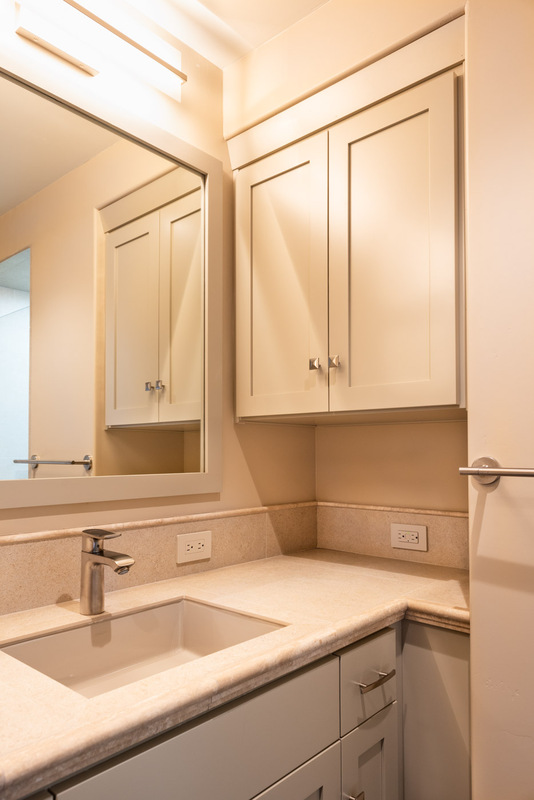 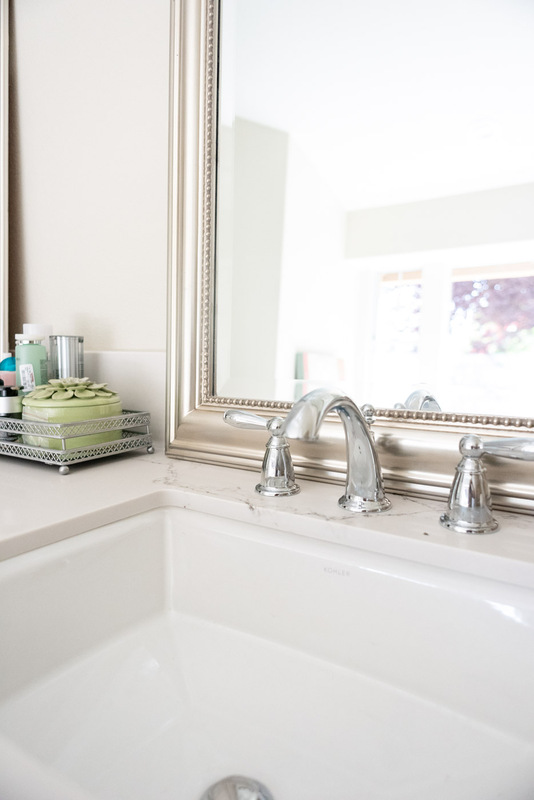 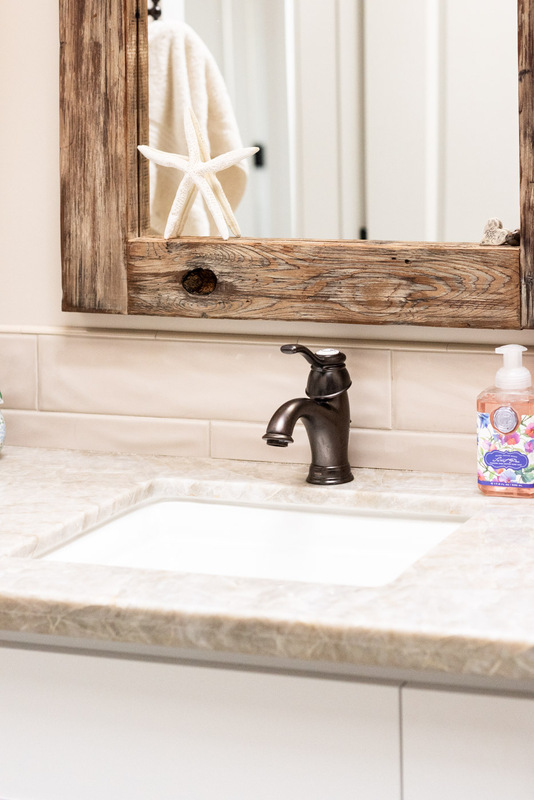 The basin sink in the small hall bath adds just enough visual interest to an otherwise understated space.